Feel the angel’s unconditional love for YOU! “First please know that we love you. For love is all there is and we are nothing but 100% pure love and light. As messengers of God, we want nothing other than to offer you our unconditional love, support and assistance. All you need do is ASK, BELIEVE and then ACT upon the guidance you receive. The hardest part for most of you is to believe. Jesus once said, “If you have faith the size of a mustard seed you can move mountains.” This is your only job, to believe that with the help of the divine, all things are possible. You live in an abundant universe filled with everything you’ll ever need. Your only job is to get clear about what you want, hold the intention with emotion in your heart, and believe with your heart, mind and soul that it can and will happen. If there is anything more you need say or do we will gently nudge you and guide you in a most loving way. 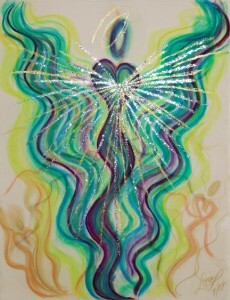 Go forth now, like this Angel of the World, and let your hearts of gold radiate pure love and light to one another. Angelica oil (Angelica archangelica) has soothing qualities that help relax nerves and muscles. In Germany, angelica was historically referred to as the “oil of angels,” in part because of its ability to calm anxiety, restore happy memories, and bring peaceful sleep. Traditional medicine practitioners used angelica as a stimulant, digestive tonic, and expectorant.